As well as holding your own FUNDRAISING ACTIVITIES (see below),YOU can support us by purchasing items from our Multey branch or on our Amazon page. All items sent to us will be used either for the cats in our care, or at events to sell or raffle to raise valuable funds for their care. We have a number of online donation links, some of which are free! Click here to purchase products on our Amazon.co.uk store. Click here to subscribe to our Mewsletter, discover paw-some information and make an impact at the same time. Every year Cats Protection run the Paw Some Afternoon Tea campaign. Get together with a group of friends CATch up and raise money for great cause. Volunteers Liz, Nick and Val held an afternoon tea party and managed to raise £500!! Please check the news feed for details of the Paw Some Afternoon Tea. Perhaps you can run your own fundraiser? - If you missed the last PSAT event, don't worry, you can always organise a coffee morning and raise funds for the cats in our protection in Plymouth? - Do you facepaint? How about donating a percentage of your profit for every time some requests a cat face? 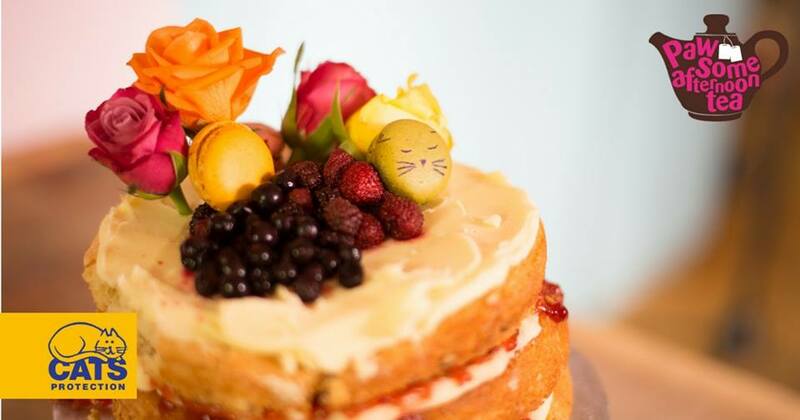 - Could you bake a cake...or many cakes... and sell them to raise money for Cats Protection Plymouth? - Do you sew, knit or crochet? We'll sell any items you want to make and donate. - Do you crave adrenaline or just love the outdoors? There are many fundraising opportunities out there, please choose to support Cats Protection Plymouth. - Look out for collection boxes/buckets, they'll accept small change and even foreign coins! If you have an fundraising ideas of your own, like jumping out of a plane or running a marathon and need want to support the cats in your local area then please contact us here.